Give your brand a makeover with our Pop Makeup business card design template, perfect for makeup artists, beauticians, spas, and salons. 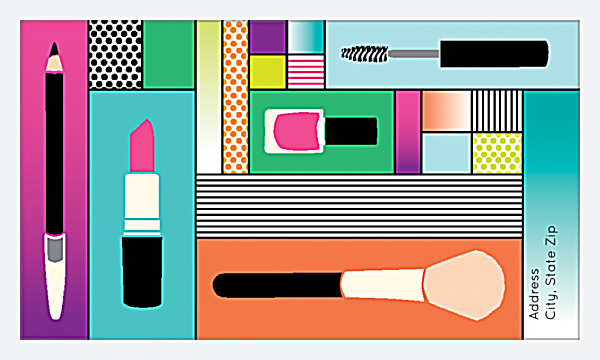 On the back, modern icons representing an eyeliner, lipstick, nail polish, and other beauty elements stand out against a background of solid colors and retro pop patterns. The front features your company name in bold line art and draws attention to your contact information with contemporary icons. Customize Pop Makeup with your own text, then choose from two layouts (horizontal or vertical), five color schemes, and four trim patterns to print business cards that showcase how truly unique your brand is. Make your own business cards online with PsPrint’s intuitive design tool – no graphic designer needed! Select your template options, then use the online menu to add your custom text and images. 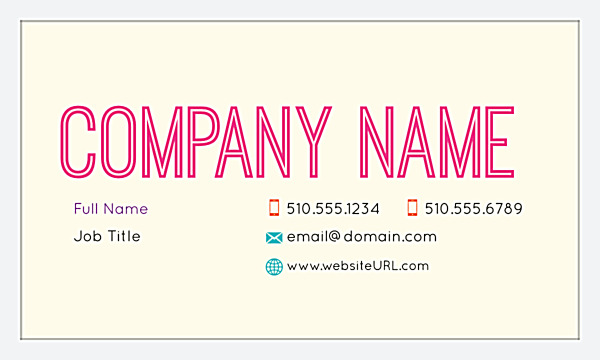 With our design tool, you can create your own business card online in mere minutes! Lightning-fast printing turnaround and reliability set PsPrint apart from our competition. Your business card will be printed on beautiful paper stock that enhances your design and helps set you apart from your competitors. We’re so sure you’ll love your business cards, we back every project with our rock-solid customer satisfaction guarantee.